Today’s homes are designed and built to be more airtight and energy efficient than ever, so ventilating the pollutants from cooking, showering, and cleaning is vital to the health of the residents and to the structural integrity of the home. A bathroom ventilation fan is sold as a unit, ready for connection to wires and the vent. Buy on Amazon. According to the Home Ventilation Institute, the industry’s trade association, during a shower, the humidity level in a bathroom can reach that of a tropical rain forest—uncomfortable and hot. Just the simple act of showering can produce a breeding ground for mold, mildew, and micro-organisms that can not only damage your home but also affect your well-being. Mold in the bathroom is especially problematic. Mold is a fungus that thrives in warm, dark, humid environments. It spreads via spores that grow on wet or moist organic surfaces such as wood, wallboard, and bathroom tile. The only effective way to prevent mold is to attempt to keep indoor moisture levels low. Mildew is simply a type of mold that spreads particularly well in organic, moisture-rich environments. The main problem with showering when there is not proper ventilation is the build-up of moisture, which can deteriorate joists above and framing around the bathroom, crack or peel paint, ruin gypsum wallboard, warp cabinets, and erode fixtures. The formation of mildew on tile grout is encouraged by these conditions. 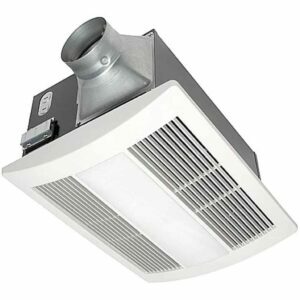 However, bathroom exhaust fans, ducted to the outside, effectively remove moisture during and after a shower and help prevent the growth of harmful bacteria as well as assist in eliminating unwanted bathroom smells. 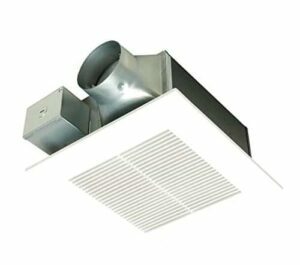 The primary use of an exhaust fan is to extract moist and stale air from the bathroom and deposit it outside the home. 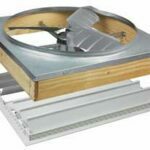 An exhaust fan is designed to be out of sight, anchored to the ceiling between joists, with an exhaust duct leading to the outside. The only part of an exhaust fan you should see is the grille. If you’ve spent years not utilizing your bathroom exhaust fan because of the noise, consider that some of the latest fans are nearly inaudible. 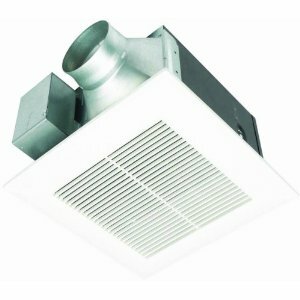 Today’s exhaust fans no longer sound like a Boeing 757 landing on top of your home, plus, they are easy to install. You can buy bathroom fans online at Amazon. When selecting a bathroom fan system, size is important. Fans are rated according to the cubic feet per minute (CFM) of air they can move. So, the bigger your bathroom, the bigger the fan it will need to exchange the air effectively. 25-Foot Measuring Tape. Buy at Amazon. Measure the room’s square footage. Be sure to include the bathtub and shower’s area in your calculation. Let’s say the room is 10 feet by 10 feet. So 10 x 10 = 100 square feet. Next measure the height of the walls. Standard walls are 8 feet, so let’s use that. 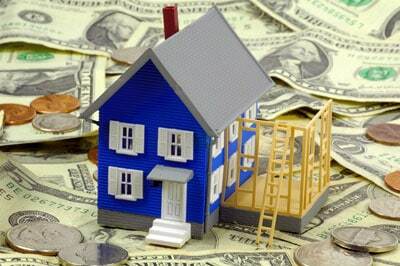 Multiply the height (8 feet) by the square footage (100). In other words, 8 x 100 = 800. 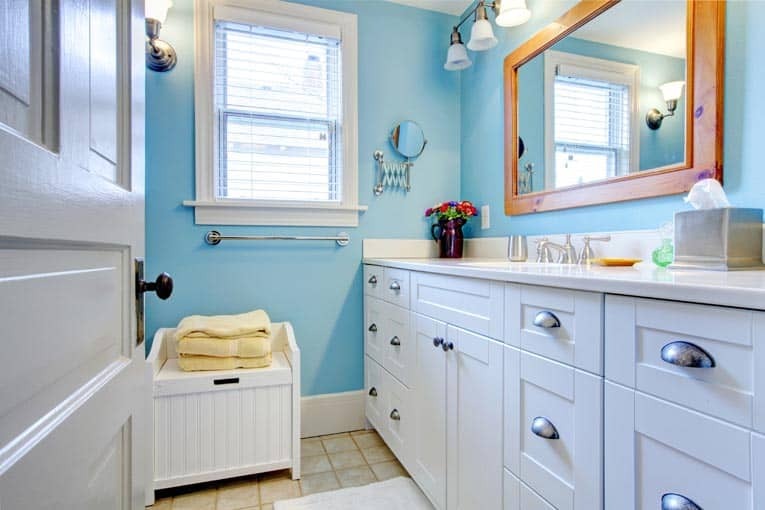 A 10 x 10 bathroom with an 8-foot ceiling is 800 cubic feet. To be effective, the bathroom fan should replace the room’s entire volume of air 8 times per hour—in other words, every 7.5 minutes. To figure the CFM requirements of a fan, divide your bathroom’s volume in cubic feet by 7.5. For example, a bathroom with a volume of 800 cubic feet should have a fan that is rated at 107 CFM (800 / 7.5 = 106.6). This bathroom fan doubles as a heater and nightlight—it’s designed for quiet operation. Buy on Amazon. • A ceiling light—when the switch is turned on, both fan and light are activated. • Activation of the fan according to preset humidity levels. • A motion sensor that turns on the fan automatically if someone enters the bathroom and stays running for a predetermined amount of time. 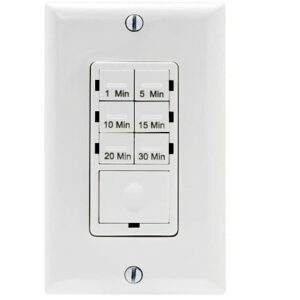 • A timer switch, which, after it is activated, will keep the fan running for the time indicated, even after the light is turned off. • Replacing an existing exhaust fan is a lot less complicated than a new installation because the latter means routing the exhaust duct through the ceiling or a wall. For information on how to install a bathroom fan, please see How to Install Bathroom & Kitchen Fans. If you plan to connect a bathroom exhaust fan yourself, make sure you understand your home’s electrical wiring and how to turn off the power at the circuit box. Low-profile bathroom fan fits in 2×6 ceiling framing. Buy on Amazon. • Install the fan as near or directly over the shower as possible to capture moisture immediately. Make sure your exhaust fan terminates outside, not in the crawlspace or attic. The venting that leads to the outside should point downward to prevent rain or debris from entering the house. • Always follow the manufacturer instructions that accompany the purchase of your exhaust fan. • Check with your local planning department to see if a permit is required for installation. • Look for fans that meet the energy-efficient requirements of Energy Star. • Make sure your fan is UL listed for wet locations. A UL-recognized housing has a tough protective shell that is certified for performance in wet regions. • If you have a steam shower, use a separate fan on a timer so that it can be shut off during shower use and then run afterward to dry the shower stall. Countdown timer for a bath fan can be set to shut off a few minutes after a shower. Buy on Amazon. • Don’t run your exhaust fan any longer than necessary. While an exhaust fan is operating, it is exhausting air and moisture to the outside; however, at the same time, whatever the fan blows out can leak back into the house somewhere else. • You do, however, need to run the fan for a time period that will properly remove any moisture and provide a complete exchange of room air. Running an exhaust fan for only a few minutes after a long, hot shower or a relaxing bubble bath is not sufficient. It takes approximately 20 minutes to remove all moisture for most standard-sized bathrooms.